Chef Anthony Bourdain speaks at New York Society for Ethical Culture in Oct. 2017. Bourdain died at age 61 on June 8. Anthony Bourdain's Twitter bio simply reads "enthusiast" which may be why the news of his death by his own hand has hit many fans so bluntly today. He was a truth-telling enthusiast you could trust. He explored the world for us with open heart, eyes and certainly appetite. Who among us didn't want to join him at a meal or on an adventure? In 2007, World Cafe jumped at the opportunity to hear the music that moved Bourdain on our "Top Five" series. He clearly loved gritty music as much as he loved street food. If ever there was any doubt that the celebrity chef and brilliant TV journalist was at heart a punk rocker, his picks make it clear: He names Iggy Pop, Richard Hell and the Voidoids and more from punk's flowering. 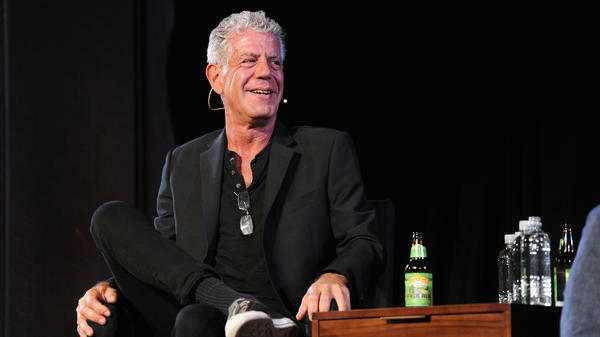 Bourdain formed his musical tastes roaming rock venues late at night after shifts on the line at storied NYC restaurants. Get a peek into Anthony Bourdain's musical enthusiasms in this interview.